This post may contain compensated links. Refer to my disclaimer for more info. Although we didn’t arrive by luxurious yacht onto Jekyll Island, Georgia like the wealthy elite that bought the island in the 1800s, we certainly felt the Victorian elegance of this enchanting island the moment we crossed the causeway. 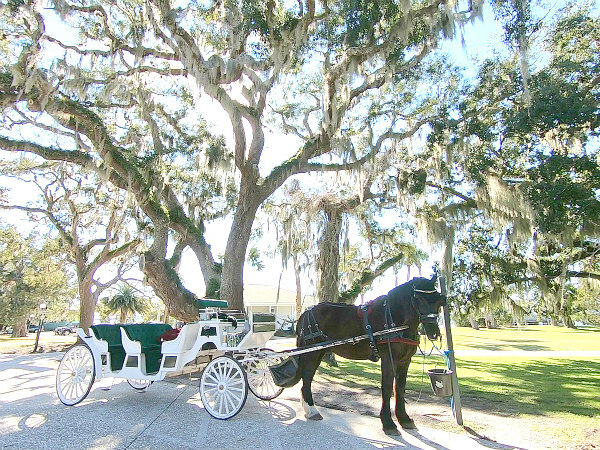 As a travel journalist, I’ve seen a lot of vacation destinations, but the spectacular balance of nature, glamorous Jekyll Island Club, and all of the unique Jekyll Island things to do for families is truly a rarity. Here are the top six reasons that you’ll want to plan an annual family vacation tradition to this paradise. After all, there is a famous legend floating around… Have you heard about it? Countless blockbusters have been filmed on Jekyll Island because of the breathtaking scenery, yet somehow this barrier island is still flying under the radar as a vacation escape. Thanks to the Jekyll Island Club Resort for hosting us, and, as always, my Southern opinions are my own. Links to venues and activities mentioned will be listed at the end for your convenience. The moment we entered the Historic District, we felt as though we’d stepped back in time because all 240-acres of the Jekyll Island Club Resort and Island Cottages have been preserved in the splendor of the Gilded Age – earning an induction into the Historic Hotels of America. The attention to detail that began with the valet staff was extended to our luxurious suite, the gorgeous river view, and the grand architecture. As we navigated throughout the property, we found beauty around every corner of the perfectly manicured grounds. 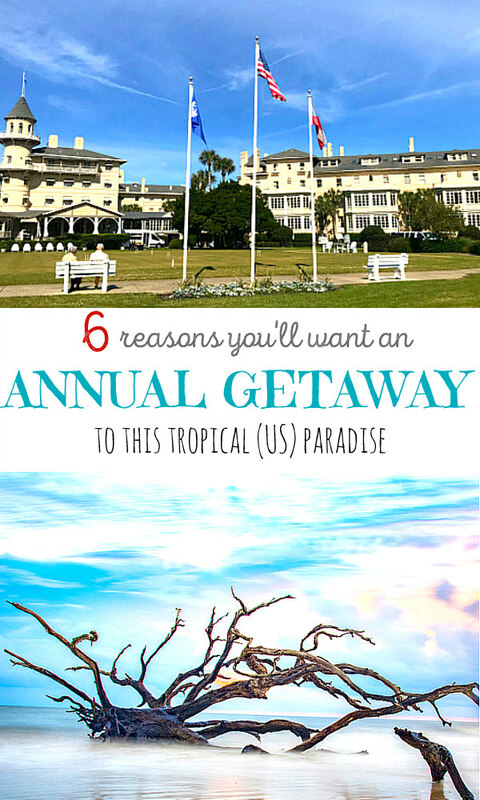 This Jekyll Island resort certainly knew exactly how to pamper us in every way. Our luxurious suite had a double balcony and that’s where I spent most of my time when we weren’t exploring the island. Again we felt as if I’d been whisked away to yesteryear world of glamour and leisure when we watched a Cinderella-like horse and carriage pass below our balcony and later saw a group of couples dressed in Victorian-period attire play croquet on the front lawn. When I first heard stories of Jekyll Island treasure hunting, I was intrigued. A hide-and-seek game to find collectible gems on a secluded island?! Yes, please, sign me up! 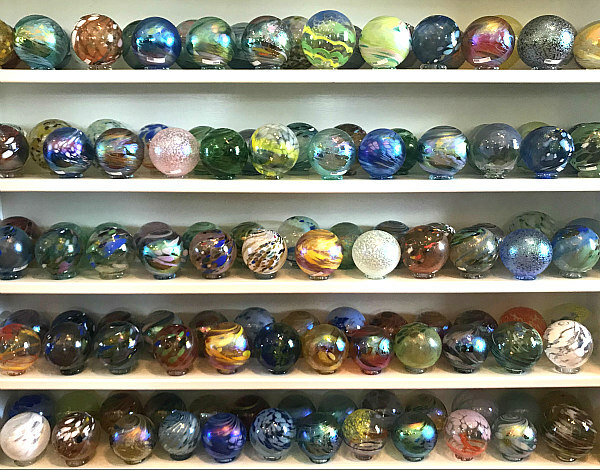 Every January and February, Jekyll Island volunteers called “beach buddies” hide replicas of glass globes that replicate glass fishing floats used by fishermen all over the world in years past to keep their lines afloat. We found out that guests find these globes “hidden” in plain sight… on a bench, in a flower bed, on the front porch of a cottage. They are never off of a public path or in the marsh or dunes. “Wow” is what I mumbled under my breath several times during our guided tram tour. Our expert guide did a fantastic job of bringing the stories to life of the elite Jekyll Island Club members that created an exclusive island retreat for family and friends. I was captivated because I’m a history buff, but also because our guide slowly drove through the entire 240-acre historic district while sharing juicy details about what was called back in the day “the richest, the most exclusive, the most inaccessible club in the world.” We were even able to tour two of the millionaire cottages that were full of period-style furnishings and more stories. Did you know that men with famous last names like Rockefeller, Morgan, Vanderbilt, Pulitzer, and Baker wanted this island as a retreat for their friends and families and that together they represented one-sixth of the world’s wealth?! When my daughter expressed how much she’d like to explore the island and hunt for treasure via bike paths, I didn’t know if this was going to end well or not! Boy, was I delightfully surprised! When we arrived at the bike rental center, there were many sizes and styles to choose from. I fell in love with the bike rental I was given because of the rugged tires, comfy seat, and the zip pouch attached to the front to hold our belongings. We had one of the most memorable family bonding days while riding our bikes that day. My daughter still hasn’t stopped talking about it and we decided that it was our second favorite part of the trip – next in line to staying in our favorite luxurious Jekyll Club suite. When most of the United States is dealing with snow and ice, this Southernmost island of the Golden Isles has very mild winters. The Gilded Age millionaires were certainly on to something when they acquired this Southern playground for its Jekyll Island weather. Can you believe that the annual average annual average temperature is a delightful 68º F here? We were in full agreement of sadness when it came time to leave our stress-free oasis. We fully recognized that this vacation was unique in many ways but mainly in the fact that we literally forgot the world we left behind. Not once did I worry about stresses that we all have in our daily lives. I believe the reason is because Jekyll Island, Georgia literally melts stress away the moment you drive across the causeway. The fact that it’s only 65% developed, 35 % nature and seclusion, and includes just the right amount of amenities at your fingertips was soothing to our souls. We’ve been to nice resorts and pretty islands, but we’ve never truly relaxed like we did on Jekyll Island. 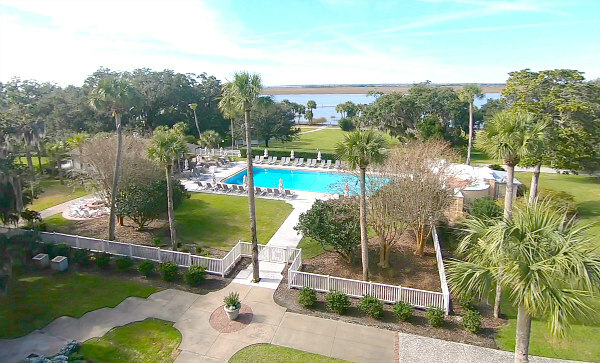 Jekyll Island Club Resort: 371 Riverview Drive Jekyll Island, GA Facebook link Instagram link any other sm links? care of us in every way! Do you have any secrets you’d like to share about Jekyll Island? I’d love to hear from you in the comments! 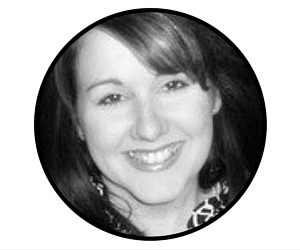 She shares travel reviews & insider secrets that Women REALLY want to know about southern family destinations and creating cozy homes they can’t wait to go home to. Her hope is that overwhelmed women feel like family travel and cozy home gurus in their own right. It is!! 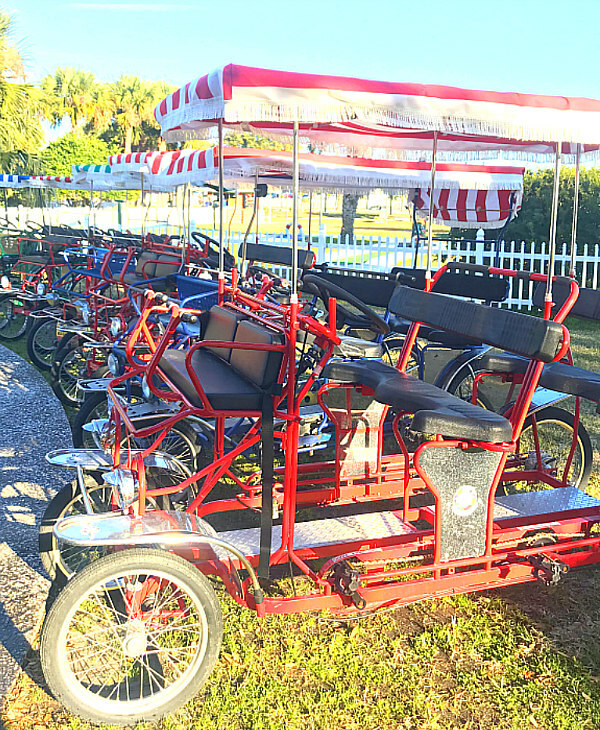 Very dreamy with tons of family friendly activities too – any time of year! It's me, Shan, over here sharing all the southern family travel secrets, tips, & travel reviews of accommodations, eateries, & attractions that women REALLY want to know! "how to" home hacks to create a cozy haven Moms can't wait to come home to!